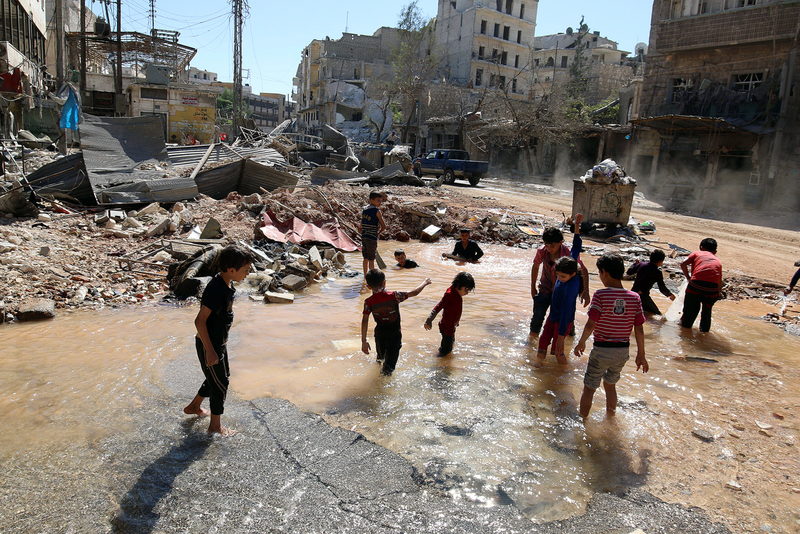 Children play with water from a burst water pipe at a site hit yesterday by an air strike in Aleppo's rebel-controlled al-Mashad neighbourhood, Syria. The Russian military have not been using combat aircraft in Syria’s Aleppo for 16 days already upon the orders of President Vladimir Putin, Defense Minister Sergei Shoigu said on Nov. 1. "We have not been using warplanes in Aleppo for 16 days following the order of the commander in chief of the Armed Forces of the Russian Federation," Shoigu said. He also said that "over 2,000 so-called moderate opposition members carried out attacks on residential areas, schools and hospitals with the support of 22 tanks, 15 IFVs, multiple launch rocket systems and eight vehicles with suicide bombers." Shoigu said most of this military hardware had been eliminated. Russian and Syrian warplanes halted their airstrikes on Aleppo on Oct. 18. On Oct. 28, the Russian military asked Putin to permit resumption of airstrikes on eastern Aleppo, citing militant activity. However, the president gave no such permission and the humanitarian pause was extended.